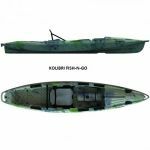 High quality inflatable boats for fishing, sport and tourism. Made of 5 layer reinforced PVC material.The producer of the material is one of the leading manufacturer of high quality PVC and it has a density of 750 to 1450 gr. / Sq.m. .The material is resistant to UV, salt water, fuels and oils. Retains its properties at temperatures from -30 C to +60 C.
All boats are made according ISO/CD6185 standard and come with a certificate of conformity CE BureauVERITAS (France). Warranty:3 years for boats ,1 year for accessories. After a request,the Yerliyurt boats can be made with a reinforced transom (extra charge) or a custom color (no extra charge) or with a transom for an engine with a short shaft.